To keep your customers in your store, and control the entire checkout process, you need a payment platform that can be built into your site and app. Braintree—part of the PayPal family—is a tool that will help you. Braintree payment gateway is one of the easiest ways to accept online payments from customers. Your clients will be pleased with this easy payment and safe transactions. For Multi-Vendor platform we have created a Braintree Marketplace add-on, which allows to automate revenue splitting and refund processing. Note: for the correct operation of the add-on the PHP version should be at least 5.4.0. — Ability to accept payments using Braintree payment system. — Through Braintree you are able to accept all Major Credit Cards / Debit Cards – Visa, MasterCard, American Express, Discover, Diner’s Club, JCB. — Ability to accept PayPal payments, Apple Pay, Google Pay, Dron-In UI. — Advanced features give proven data protection to keep the business safe and secure. — Additional verification with 3D Secure (i.e. authentication using bank login credentials). — Easy-to-understand payment processing allows your customers to make orders within seconds. — Customer information is securely stored in the Braintree Vault. — Ability to confirm saving customer CC info on the Braintree server. 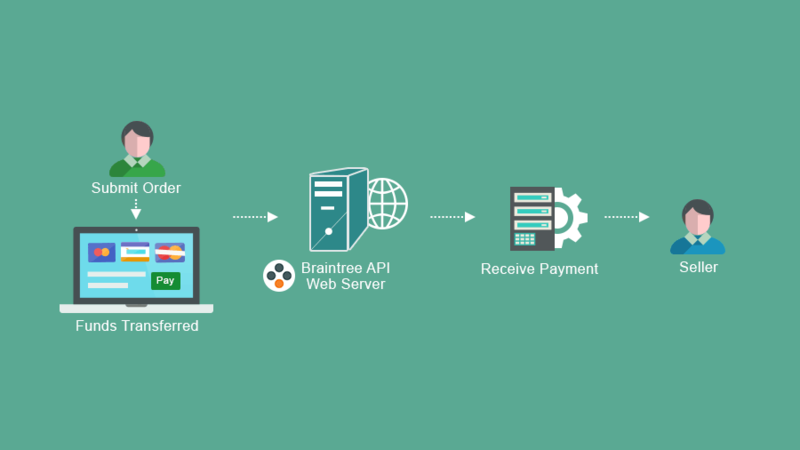 To learn more about Braintree payment visit https://www.braintreepayments.com. Install the add-on and select if you will show a confirmation to save CC info. Once you have installed the add-on you need to create a new payment method on the payment methods list page Administration → Payment methods. 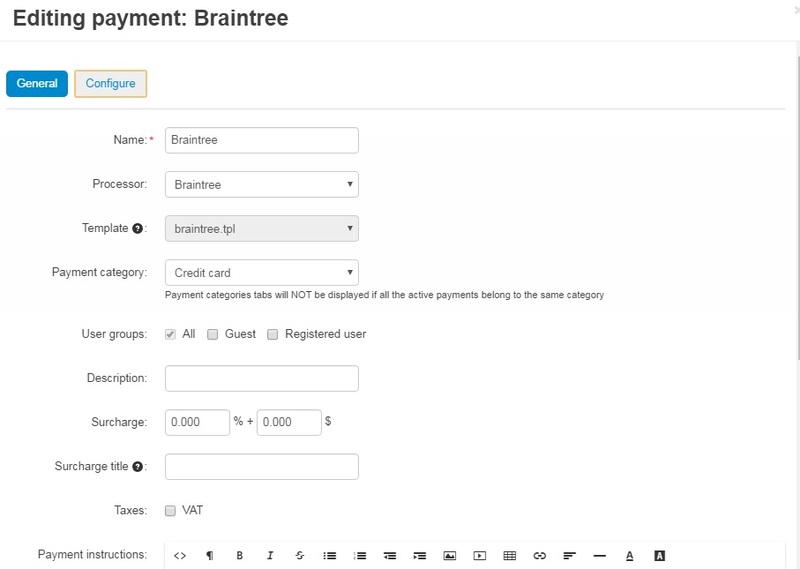 To use the Braintree payment gateway, it is necessary to select the appropriate value in the Processor field in the "General" tab. In the "Configure" tab, the store administrator should save the data of the payment account: Merchant ID, Public key and Private key. 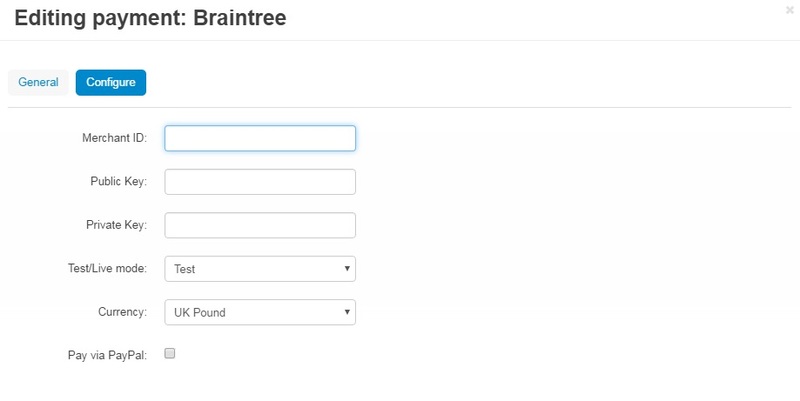 To create an account please go to the official Braintree payments website. Once you’ve set up the Braintree payment gateway in the store, it will get available to your customers. So the customer adds products to cart and proceeds to checkout. At the Billing Options step, they will see the Braintree payment method available. When a customer pays using Drop-in UI they can save their payment info for future purchases. If the customer selects the I confirm saving my CC info on the Braintree server checkbox at checkout, the customer information (first name, last name, company, email, phone, email, and website) will be saved in the Braintree Vault. When a customer updates their information in the profile, this information is updated on the Braintree side too. The add-on is compatible with CS-Cart 4.3.5 and above. This add-on is developed and published by Simtech Development Ltd., a CS-Cart developer. You are guaranteed the ability to buy quality add-ons to support future versions. If you need help, please contact us via our help desk system. I’ve tried many payment apps over the years but this is by far the best. I highly recommend it. This a great comprehensive payment application that will impress your customers. It gives the impression that your website is just as good as any of the big boys. Apple and Google Pay are a must have for all websites that want to expand their mobile commerce. Customers want the convenience of ordering on their smart phones and that trend will only increase. I have seen a significant jump in my mobile storefront business with them and I expect it will eventually surpass my other payment methods. The add-on also allows customers to process credit cards through Braintree and securely store their credit card info in Braintree’s vault. That’s a big plus for convenience. It also gives Paypal as a payment method so you are getting a full payment suite at a good price. And refunding is very easy because you can do it right from the order in CS-Cart. The development team hit it right on this one and the support team was very helpful. For example, Apple Pay needs a domain association file to be downloaded and the support team was actually better than the Apple helpdesk in providing instructions on how to do it. I am using this addon and find it works perfectly in my store. So many more payment options lead to increased sales. A good investment worth the extra sales it creates. Probably best addon for braintree (paypal) system available yet. Easy to setup, very informative admin order details page. Only downside is 3DS is not supported in this version, sometimes gateway insists on using it for particular more risky product range.